Jeff Fowkes Wheels Limited uses seasonal opportunities to keep its tyre safety message fresh and targets specific audiences with focused campaigns. Why did Jeff Fowkes Wheels get involved? Jeff Fowkes Wheels set out to deliver information which can prevent illegal and defective tyres being in use. To directly measure this is very difficult but the garage gauges the interest and participation from motorists and those that they deliver the information to and be confident that that their efforts are working to an advantage. What did Jeff Fowkes Wheels do? Jeff Fowkes Wheels began the year by encouraging all motorists to make checking tyres a new years resolution and carry out tyre safety checks on a monthly basis via social media and an in store display. Using a Valentines Day love theme, the garage created a campaign called ‘Love your tyres’ and had a logo created to be used on mugs and balloons as well as information leaflets. A large display in the showroom highlighted different areas of tyre safety and encouraged motorists to give their tyres some love! The garage also sends out a tyre safety check and reminder to customers during March and April that they should change back to summer tyres. Coinciding with the local school holidays, the garage also promotes TyreSafe’s brand new caravan campaign for 2016 as spring is when larger numbers of caravans are expected on the road. Tyre Safety Month saw tyre safety packs sent out to parents via local schools and distributed before half term to remain fresh in parent’s minds before long journeys. Adding Tyre Safety Month messages to customer invoices and to date over 3000 invoices have carried tyre safety messages. Campaign posters and leaflets were displayed within the busy showroom and reception area. 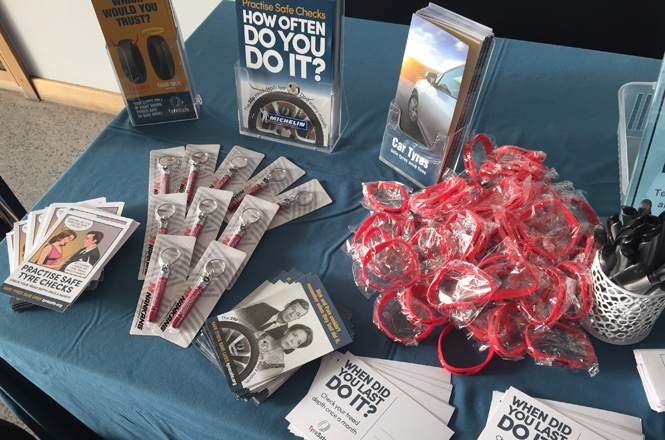 In November 2015, Jeff Fowkes Wheels attended a two day young driver event at the local college and their stand featured a number of illegal tyre examples. Following the event, a number of students and college staff visited the garage in order to have a free tyre safety check. A large number of customers visit Jeff Fowkes Wheels on a monthly basis for free tyre checks, which has now become a standard. During this check the staff check the tyres’ general condition and check for any cuts, lumps, bulges or other damage to the tyre and remove any embedded objects. The garage sends out free MOT and Service reminders to existing customers and have added a tyre safety message and information leaflet to these letters (approximately 50 per month). Jeff Fowkes Wheels participates greatly in the Home Safely on Safe Tyres campaign via promotion on social media channels and staff are booked to attend a number of local baby and toddler events to promote the campaign. There was a fantastic response to all campaigns and events and the home safely campaign is set to achieve fantastic results despite being early days. It is difficult to get statistics which give direct figures and results but the work of the garage is more about education and working to prevent potential safety issues.